Autonomous Cars with Marc Hoag is the world's only weekly podcast dedicated entirely to driverless cars, and the #1 result on Google! We discuss the products, tech, law, policy, and societal impacts of self driving cars as they start to become a thing in our everyday lives. Participation is encouraged, and let's have fun discussing what is sure to be the greatest step change in humanity since the Industrial Revolution! EN: For the French, losing Notre Dame would be like losing the White House or the US Capitol here: it isn't just a cultural icon admired by humanity around the world, it's a physical manifestation of the very fabric of France and all her history. FR: Pour les français, perdre Notre Dame c'est comme perdre le White House ou le US Capitol: c'est pas simplement une icône culturelle qui est admirée par humanité autour du monde, c'est un manifestation physique du tissu vrai de la france et toute sa histoire. Ep 86: INTERVIEW: Matthew Gibb, Chairman, The NEXT Education, on AV connectivity; 5G; and more! Ep 83: Predictive vision for AVs; Future of insurance; Ford & VW to partner up? Ep 82: My solution for AV traffic problems; infrastructure upgrades to expedite AV deployment; when WILL we see L5 AVs, anyway? Ep 81: Air traffic control for cars; Amazon invests in AV startup; how will 5G be deployed? QUESTION: Should I split tomorrow's 45 minute episode into two parts? If you remember, I was invited to be a guest on the podcast of the law firm TuckerEllis LLP in which we discussed, above all, the standard of care to which autonomous cars should be held in an autonomous future. That episode ended up clocking in at a whopping 45 minutes in length, so I'm running a poll on Twitter to get a sense for whether you'd like me to release it as one large episode tomorrow (Friday, Feb 1) or to split it into two parts, with Part II airing next Tuesday (Feb 5). Let me know by casting your vote now on Twitter @AutonomousHoag! Today: (1) We discuss the AV consortium being assembled amongst the German automakers to help share development costs (but really to cover their asses); (2) I did MIT's trolly paradox experiment and share my results with you; (3) Apple just slashed 200 jobs from their Project Titan autonomous car project, and I think I just figured out what they're up to. Read, listen, and discuss this episode at MarcHoag.com Follow us on Twitter at twitter.com/AutonomousHoag Follow us on Instagram at instagram.com/autonomoushoag Like us on Facebook: fb.com/autonomoushoag Subscribe to our new YouTube channel at youtube.com/channel/UCzDAWTzwkA_MgmqoOKhHYzQ Support this podcast with easily monthly contributions at anchor.fm/autonomous-cars-with-marc-hoag ! We discuss a deeply moving and inspiring email from a listener pushing for autonomous vehicles for people with disabilities; I respond to another listener's questions; and we talk about autonomous scooters. Read, listen, and discuss this episode at MarcHoag.com Follow us on Twitter at twitter.com/AutonomousHoag Follow us on Instagram at instagram.com/autonomoushoag Like us on Facebook: fb.com/autonomoushoag Subscribe to our new YouTube channel at youtube.com/channel/UCzDAWTzwkA_MgmqoOKhHYzQ Support this podcast with easily monthly contributions at anchor.fm/autonomous-cars-with-marc-hoag ! SEASON 3 PREMIERE, EP 75: CES 2019! The good folks over at HERE Technologies (Twitter; Facebook) invited me to join them in Las Vegas for CES 2019 and help moderate a few days of talks and conduct a few interviews. This is my account of CES 2019 generally; some exclusive interviews with various AV companies at CES including Innoviz CEO Omer Keilaf; and an insider look at what HERE Technologies are up to with their open and neutral platform of self-healing, realtime HD maps. Read, listen, and discuss this episode at MarcHoag.com Follow us on Twitter at twitter.com/AutonomousHoag Follow us on Instagram at instagram.com/autonomoushoag Like us on Facebook: fb.com/autonomoushoag Subscribe to our new YouTube channel at youtube.com/channel/UCzDAWTzwkA_MgmqoOKhHYzQ Support this podcast with easily monthly contributions at anchor.fm/autonomous-cars-with-marc-hoag ! MEET ME AT CES 2019 NEXT WEEK! The good folks over at HERE Technologies have invited me to join them at CES 2019 next week in Las Vegas! I'll be there Monday through Thursday, so if you'll be there and if you'd like to meet up, let's do it! Just schedule a 15- or 30-minute block of time with this link (https://calendly.com/autonomoushoag) and I'll see you then! Cheers! Today, Episode 74, THE SEASON 2 FINALE! Today: I make a few announcements; I answer some listener-submitted questions; we discuss whether autonomous vehicles will eventually need a government body like the FAA/ICAO/IATA for aviation; and, we talk about the Tesla driver who fell asleep, and why it's such an incredibly strong validation for a future of autonomous vehicles. Today, Episode 73! Teslas will soon get you door-to-door with no human intervention at all; Ford & VW partner up on AV tech; and we talk about the transition from human-driven to autonomous cars in the coming decades. Read, listen, and discuss this episode at MarcHoag.com Follow us on Twitter at twitter.com/AutonomousHoag Like us on Facebook: fb.com/autonomoushoag Subscribe to our new YouTube channel at www.youtube.com/channel/UCzDAWTzwkA_MgmqoOKhHYzQ Support this podcast with easily monthly contributions at anchor.fm/autonomous-cars-with-marc-hoag ! Today, Episode 72! We talk the best strategy for autonomous vehicles, and it may not be what you think; Waymo rolls out the world's first autonomous taxi revenue service; and Uber strikes back... sort of(ish). Read, listen, and discuss this episode at MarcHoag.com Follow us on Twitter at twitter.com/AutonomousHoag Like us on Facebook: fb.com/autonomoushoag Subscribe to our new YouTube channel at www.youtube.com/channel/UCzDAWTzwkA_MgmqoOKhHYzQ Support this podcast with easily monthly contributions at anchor.fm/autonomous-cars-with-marc-hoag ! Today, Episode 71: Should governments around the world slow the deployment of autonomous vehicles to help save jobs; The US government relaxes regulations on AV deployment; the end game of autonomous cars is boring. Read, listen, and discuss this episode at MarcHoag.com Follow us on Twitter at twitter.com/AutonomousHoag Like us on Facebook: fb.com/autonomoushoag Subscribe to our new YouTube channel at www.youtube.com/channel/UCzDAWTzwkA_MgmqoOKhHYzQ Support this podcast with easily monthly contributions at anchor.fm/autonomous-cars-with-marc-hoag ! Today, Episode 70! GM focuses on AVs and EVs and replace Cruise Auatomation's CEO and co-founder with GM's president; Daimler & Bosch prepare to roll out a fleet of autonomous S Class sedans in San Jose, CA next year; and Volvo & Luminar announce their partnership to the world, along with Luminar's incredible ultra long-range lidar. Read, listen, and discuss this episode at MarcHoag.com Follow us on Twitter at twitter.com/AutonomousHoag Like us on Facebook: fb.com/autonomoushoag Subscribe to our new YouTube channel at www.youtube.com/channel/UCzDAWTzwkA_MgmqoOKhHYzQ Support this podcast with easily monthly contributions at anchor.fm/autonomous-cars-with-marc-hoag ! Today, thrilled to have Martin Adler, PhD, join us from Amsterdam, on an incredibly fascinating interview that was meant to go just 15-20 minutes, but instead ended up going nearly half an hour long! Read, listen, and discuss this episode at MarcHoag.com Follow us on Twitter at twitter.com/AutonomousHoag Like us on Facebook: fb.com/autonomoushoag Subscribe to our new YouTube channel at www.youtube.com/channel/UCzDAWTzwkA_MgmqoOKhHYzQ Support this podcast with easily monthly contributions at anchor.fm/autonomous-cars-with-marc-hoag ! Today, a very special UK special edition! We discuss Wayve's machine learning algorithms designed to let cars better learn their environments; we get an overview of who's testing what, where, throughout the UK (hint -- there's a lot! ); and, we look at FiveAI's plan to test in London in 2019. Read, listen, and discuss this episode at MarcHoag.com Follow us on Twitter at twitter.com/AutonomousHoag Like us on Facebook: fb.com/autonomoushoag Subscribe to our new YouTube channel at www.youtube.com/channel/UCzDAWTzwkA_MgmqoOKhHYzQ Support this podcast with easily monthly contributions at anchor.fm/autonomous-cars-with-marc-hoag ! Today! We discuss whether you'd be more comfortable getting into a fully autonomous car (read: driverless; no human backup driver) that had the usual steering wheel, pedals, and shifter, or whether you'd be prefer something that looked truly unique and different, without such driver inputs; China launches the world's first solid state lidar-equipped AV; and BMW readies its own solid state lidar-equipped cars with Innoviz. Read, listen, and discuss this episode at MarcHoag.com Follow us on Twitter at twitter.com/AutonomousHoag Like us on Facebook: http://fb.com/autonomoushoag Subscribe to our new YouTube channel at www.youtube.com/channel/UCzDAWTzwkA_MgmqoOKhHYzQ Support this podcast with easily monthly contributions at anchor.fm/autonomous-cars-with-marc-hoag ! Ep 66: SPECIAL: Insider tour of HERE Technologies' Berkeley, CA garage offices! Last week I had the great privilege to be invited to a special, invite-only media event at HERE Technologies' garage offices in Berkeley, CA, to learn everything about their "self healing HD maps." Read, listen, and discuss this episode at MarcHoag.com Follow us on Twitter at twitter.com/AutonomousHoag Subscribe to our new YouTube channel at www.youtube.com/channel/UCzDAWTzwkA_MgmqoOKhHYzQ Support this podcast with easily monthly contributions at anchor.fm/autonomous-cars-with-marc-hoag ! Today, Episode 65: Elaina Farnsworth, CEO of The NEXT Education (thenexted.com), on her mission to educate and empower the world's talent for this new era of autonomous and connected mobility. Read, listen, and discuss this episode at MarcHoag.com Follow us on Twitter at twitter.com/AutonomousHoag Subscribe to our new YouTube channel at www.youtube.com/channel/UCzDAWTzwkA_MgmqoOKhHYzQ Support this podcast with easily monthly contributions at anchor.fm/autonomous-cars-with-marc-hoag ! Humans will apparently always be illogical; iSee is developing software that brings common sense "understanding" to autonomous vehicles; Cruise Automation still on track to roll out fully autonomous cars on the streets of San Francisco by next year. Read, listen, and discuss this episode at MarcHoag.com Follow us on Twitter at twitter.com/AutonomousHoag Subscribe to our new YouTube channel at www.youtube.com/channel/UCzDAWTzwkA_MgmqoOKhHYzQ Support this podcast with easily monthly contributions at anchor.fm/autonomous-cars-with-marc-hoag ! Waymo gets approval to test its autonomous cars without backup drivers in California; Volvo & Baidu team up to work on L4 autonomous taxis in China; Tesla readies Summon, while Faraday Future becomes Faraday Failure. Read, listen, and discuss this episode at MarcHoag.com Follow us on Twitter at twitter.com/AutonomousHoag Subscribe to our new YouTube channel at www.youtube.com/channel/UCzDAWTzwkA_MgmqoOKhHYzQ Support this podcast with easily monthly contributions at anchor.fm/autonomous-cars-with-marc-hoag ! We'll discuss why the trolly paradox isn't a real issue after all, or at least, why it shouldn't be; Tesla's Autopilot V9.0 with Navigate on Autopilot is a game changer; and we look at countries' preparedness for an autonomous future round the world. Read, listen, and discuss this episode at MarcHoag.com Follow us on Twitter at twitter.com/AutonomousHoag Subscribe to our new YouTube channel at www.youtube.com/channel/UCzDAWTzwkA_MgmqoOKhHYzQ Support this podcast with easily monthly contributions at anchor.fm/autonomous-cars-with-marc-hoag ! Today, Episode 61! We talk again about the trolly paradox, and the need to program autonomous to mirror various cultures' social norms, conventions, and expectations; GM's Cruise Automation has a small problem in that it's not so good at detecting pedestrians (oops); and, we discuss VW's strategy towards besting Tesla at it's own game... by 2020. Read, listen, and discuss this episode at MarcHoag.com Follow us on Twitter at twitter.com/AutonomousHoag Subscribe to our new YouTube channel at www.youtube.com/channel/UCzDAWTzwkA_MgmqoOKhHYzQ Support this podcast with easily monthly contributions at anchor.fm/autonomous-cars-with-marc-hoag ! Today, Episode 60! Autonomous taxis start replacing beloved London cabbies by 2021; Lyft pushes ahead with its Level 5 autonomous Fords; and, Apple submits another AV patent, this time, for a peloton -- autonomous platooning -- concept. Read, listen, and discuss this episode at MarcHoag.com Follow us on Twitter at twitter.com/AutonomousHoag Subscribe to our new YouTube channel at www.youtube.com/channel/UCzDAWTzwkA_MgmqoOKhHYzQ Support this podcast with easily monthly contributions at anchor.fm/autonomous-cars-with-marc-hoag ! Today, Episode 59: Tesla (Elon Musk, really) has just removed the rather confusing "fully self driving" functionality option on Tesla cars' order forms; we learn a few bit of details -- without much detail, honestly -- about the Apple Car; and I discuss an interesting article on how six US cities are preparing for the AV car revolution. All this, right now! Read, listen, and discuss this episode at MarcHoag.com Follow us on Twitter at twitter.com/AutonomousHoag Subscribe to our new YouTube channel at www.youtube.com/channel/UCzDAWTzwkA_MgmqoOKhHYzQ Support this podcast with easily monthly contributions at anchor.fm/autonomous-cars-with-marc-hoag ! Today, Episode 58! Volvo and Nvidia partner up for improved autonomy in Volvo's early 2020 vehicles; self driving cars pose a serious health risk; and, Waymo racks up 10 million miles of on-road tests (and 7 billion simulated miles!) and prepares for its first revenue autonomous taxi service. Read, listen, and discuss this episode at MarcHoag.com Follow us on Twitter at twitter.com/AutonomousHoag Subscribe to our new YouTube channel at www.youtube.com/channel/UCzDAWTzwkA_MgmqoOKhHYzQ Support this podcast with easily monthly contributions at anchor.fm/autonomous-cars-with-marc-hoag ! TODAY! Thrilled and honored to have special guest Dan Piatkowski join me on the show! Dan's the Assistant Professor of Regional Planning at the University of Nebraska-Lincoln, and we'll be discussing his article (discussed in the second segment of the previous episode) suggesting that autonomous vehicles and pedestrian-friendly cities may be mutually exclusive goals; that we can have perhaps just one or the other, but not both. Annnnnd.... we're back with Episode 56! Sorry for the brief, unscheduled break the last two weeks, but let's dive in and pick up where we left off! Today: a brief discussion on our last #FridayPollDay on Twitter, and then: the Feds get serious about autonomous cars (in a good way); autonomous cars may actually get in the way of pedestrian-friendly urban cores; and GM's Cruise Automation gets a further $2.75 billion from Honda! All this... right now. Read, listen, and discuss this episode at MarcHoag.com Follow us on Twitter at twitter.com/AutonomousHoag Subscribe to our new YouTube channel at www.youtube.com/channel/UCzDAWTzwkA_MgmqoOKhHYzQ Support this podcast with easily monthly contributions at anchor.fm/autonomous-cars-with-marc-hoag ! We’ll be back next week! Sorry! We'll be back soon... like, next week! Sorry! Today! We talk about BMW's autonomous motorcycle; the best commercial trucking routes for autonomous trucking; and, we take a step back to look at 9 years of Waymo's biggest milestones. Read, listen, and discuss this episode at MarcHoag.com Follow us on Twitter at twitter.com/AutonomousHoag Subscribe to our new YouTube channel at www.youtube.com/channel/UCzDAWTzwkA_MgmqoOKhHYzQ Support this podcast with easily monthly contributions at anchor.fm/autonomous-cars-with-marc-hoag ! Episode 54: Companies are deploying AVs at a faster and faster pace, but are we going to see safer, cheaper, and boringer? Volvo unveils it's all-electric autonomous truck without a cab; and, Tesla whets our appetite for its fully autonomous cross-country drive with Autopilot 10 alpha, while BMW unveils its iNEXT EV, a concept car slated for 2021 that looks like a buck-toothed rhinoceros with its head transplanted onto a sledgehammer. Read, listen, and discuss this episode at MarcHoag.com Follow us on Twitter at twitter.com/AutonomousHoag Subscribe to our new YouTube channel at www.youtube.com/channel/UCzDAWTzwkA_MgmqoOKhHYzQ Support this podcast with easily monthly contributions at anchor.fm/autonomous-cars-with-marc-hoag ! Today, Episode 53! Uber's not out of the autonomous car race after all, with a new $150M investment in a new AV facility working with the University of Toronto; VW pushes for technology standardization for autonomous vehicles to ensure legal protections; and I go on a rant against articles crying out against AVs. Read, listen, and discuss this episode at MarcHoag.com Follow us on Twitter at twitter.com/AutonomousHoag Subscribe to our new YouTube channel at www.youtube.com/channel/UCzDAWTzwkA_MgmqoOKhHYzQ Support this podcast with easily monthly contributions at anchor.fm/autonomous-cars-with-marc-hoag ! Today, Episode 52! GM's autonomous car subsidiary Cruise Automation hits a regulatory roadblock to start testing in NYC; Volvo's new 360c fully autonomous bedroom on wheels is the wrong solution to the problem of congested roadways; and, the autonomous vehicle market hits $173 billion by 2023. Read, listen, and discuss this episode at MarcHoag.com Follow us on Twitter at twitter.com/AutonomousHoag Subscribe to our new YouTube channel at www.youtube.com/channel/UCzDAWTzwkA_MgmqoOKhHYzQ Support this podcast with easily monthly contributions at anchor.fm/autonomous-cars-with-marc-hoag ! Today, Episode 51! FCA gets serious about AVs with a $30M investment in an AV test facility; for the first time in history, technological development seems to be outpacing consumer demand as people get less comfortable with Level 5 full autonomy rather than more comfortable; and, Audi prepares the world for its Aicon autonomous test fleet. Read, listen, and discuss this episode at MarcHoag.com Follow us on Twitter at twitter.com/AutonomousHoag Subscribe to our new YouTube channel at www.youtube.com/channel/UCzDAWTzwkA_MgmqoOKhHYzQ Support this podcast with easily monthly contributions at anchor.fm/autonomous-cars-with-marc-hoag ! Today, Episode 50! What a milestone! Germany takes on Tesla; should Universal Mobility be a thing, and if so, how; an Apple gets into a bit of a mess. Read, listen, and discuss this episode at MarcHoag.com Follow us on Twitter at twitter.com/AutonomousHoag Subscribe to our new YouTube channel at www.youtube.com/channel/UCzDAWTzwkA_MgmqoOKhHYzQ Support this podcast with easily monthly contributions at anchor.fm/autonomous-cars-with-marc-hoag ! Today, Episode 49! Waymo's autonomous Chrysler Pacifica minivans annoy the locals in Chandler, Arizona; we discuss five industries sure to be disrupted (or invented altogether) by autonomous cars; and, China gets very serious about autonomous electric cars in the US. Read, listen, and discuss this episode at MarcHoag.com Follow us on Twitter at twitter.com/AutonomousHoag Subscribe to our new YouTube channel at www.youtube.com/channel/UCzDAWTzwkA_MgmqoOKhHYzQ Support this podcast with easily monthly contributions at anchor.fm/autonomous-cars-with-marc-hoag ! Today, Episode 48! VW invests $4B into its new vw.OS mobility platform; autonomous cars will destroy -- and create -- jobs; and Toyota invests $500M into Uber. Read, listen, and discuss this episode at MarcHoag.com Follow us on Twitter at twitter.com/AutonomousHoag Subscribe to our new YouTube channel at www.youtube.com/channel/UCzDAWTzwkA_MgmqoOKhHYzQ Support this podcast with easily monthly contributions at anchor.fm/autonomous-cars-with-marc-hoag ! Today: Volkswagen's We EV car sharing program prepares 2000 cars for Berlin; Drive.ai expands to Arlington, TX; and Lyft & Aptiv hit 5000 rides in their autonomous car sharing program in Las Vegas! Read, listen, and discuss this episode at MarcHoag.com Follow us on Twitter at twitter.com/AutonomousHoag Subscribe to our new YouTube channel at www.youtube.com/channel/UCzDAWTzwkA_MgmqoOKhHYzQ Support this podcast with easily monthly contributions at anchor.fm/autonomous-cars-with-marc-hoag ! Ep 46 - SEASON 2 PREMIERE! Better roads for AVs; no more Uber trucks; BMW gives up on AVs? Episode 45! Our final episode of the season before going on a brief summer break: A (now former) Apple employee steals Apple's autonomous car secrets; Daimler and Bosch get ready to roll out a test autonomous taxi service; and Fiat Chrysler Automobiles declare war against Tesla. Read and listen to this episode here: https://marchoag.com/ep-45-apple-worker-steals-av-secrets-daimler-bosch-roll-out-av-taxis-fca-goes-after-tesla/ Please remember to visit our new home at MarcHoag.com where you can comment and discuss individual episodes! If you like this podcast, share it with you friends and colleagues; if you're listening on iTunes Podcasts, leave 5 stars; you can leave me voicemails here on Anchor.fm (I promise to reply! ); and you can write me on Twitter @MarcHoag and find me on LinkedIn! Cheers! Today! We talk about VW's new EV car sharing program "WE"; we discuss the paradox of increased traffic caused by AVs; and (some) people will always love driving. PLUS: I spotted that mysterious, unmarked, debadged, white Subaru autonomous test vehicle roaming the streets of SF! Photo over at marchoag.com! Read and listen to this episode here: https://marchoag.com/ep-44-vws-ev-car-sharing-av-traffic-woes-people-love-driving/ Please remember to visit our new home at MarcHoag.com where you can comment and discuss individual episodes! If you like this podcast, share it with you friends and colleagues; if you're listening on iTunes Podcasts, leave 5 stars; you can leave me voicemails here on Achor.fm (I promise to reply! ); and you can write me on Twitter @MarcHoag and find me on LinkedIn! Cheers! Ep 42: World's first podcast recorded while driving a Tesla Model S with Autopilot?! Today! A very special podcast episode -- and quite possibly the world's first! -- recorded inside a Tesla Model S while driving from San Francisco to Palo Alto with Autopilot engaged, complete with my personal thoughts, feedback, and critique! Also: Ford releases an interesting test about active cruise control's ability to avoid unnecessary traffic jams, and what it means for a fully autonomous car future! Read about and listen to this episode here: https://marchoag.com/ep-42-special-worlds-first-podcast-recorded-while-driving-a-tesla-model-s-with-autopilot/ Please remember to visit our new home at MarcHoag.com where you can comment and discuss individual episodes! If you like this podcast, share it with you friends and colleagues; if you're listening on iTunes Podcasts, leave 5 stars; you can leave me voicemails here on Achor.fm (I promise to reply! ); and you can write me on Twitter @MarcHoag and find me on LinkedIn! Cheers! Ep 41. May Mobility launches autonomous electric shuttle service; the GM AV1; Faraday Future gets $2B investment! Today, Episode 40! We discuss paradoxes! Specifically: With AVs making it easier for people to drive more places more frequently and more distances, what does this mean for the environment? What do AVs mean for more drive-oriented, enthusiast car brands? And, with AVs effectively killing all sorts of driving infractions including moving violations and parking tickets, what will cities do to avoid going bankrupt? Read about and listen to this episode here: https://marchoag.com/ep-40-paradoxes-avs-and-environment-avs-and-car-brands-avs-and-cities/ Please remember to visit our new home at MarcHoag.com where you can comment and discuss individual episodes! If you like this podcast, share it with you friends and colleagues; if you're listening on iTunes Podcasts, leave 5 stars; you can leave me voicemails here on Achor.fm (I promise to reply! ); and you can write me on Twitter @MarcHoag and find me on LinkedIn! Cheers! Today! Apple hires a former ex-Waymo engineer for its Project Titan autonomous car project; Volvo invests in lidar maker Luminar; Enterprise and Voyage partner up for autonomous car rentals; and we briefly discuss rideOS and a listener's feedback. Read about and listen to this episode here: https://marchoag.com/ep-39-apple-hires-ex-waymo-engineer-volvo-invests-in-luminar-lidar-enterprise-partners-with-voyage-rideos/ Please remember to visit our new home at MarcHoag.com where you can comment and discuss individual episodes! If you like this podcast, share it with you friends and colleagues; if you're listening on iTunes Podcasts, leave 5 stars; you can leave me voicemails here on Achor.fm (I promise to reply! ); and you can write me on Twitter @MarcHoag and find me on LinkedIn! Cheers! Autonomous Cars with Marc Hoag gets its new home on the web over at MarcHoag.com ! Please check it out and share with your friends and colleagues! Today: Remote control cars -- basically drone cars -- help automated systems in the first and last mile of driving; another electric AV startup, Byton, announces it's all new concept the K-BYTE (as a successor to its previous concept, the M-BYTE); and comma.ai successfully retrofits a pre-2014 Tesla with Autopilot to more or less drive itself. PS1. Porsche's Taycan officially unveiled PS2. Something weird driving around the streets of San Francisco... Please remember: If you like this podcast, share it with you friends and colleagues; if you're listening on iTunes Podcasts, leave 5 stars; you can leave me voicemails here on Achor.fm (I promise to reply! ); and you can write me on Twitter @MarcHoag and find me on LinkedIn! Cheers! Today (1) We wonder how police will pull over an autonomous car; (2) We ponder ways to make autonomous cars socially acceptable (3) Tesla announces full self-driving features coming in August. Please remember: If you like this podcast, share it with you friends and colleagues; if you're listening on iTunes Podcasts, leave 5 stars; you can leave me voicemails here on Achor.fm (I promise to reply! ); and you can write me on Twitter @MarcHoag and find me on LinkedIn! Cheers! Today! We loop back to Episode 34 to do Part 2, in which we discuss the roll out of automation in the commercial shipping space first; Waymo's 100x increase in Chrysler Pacifica self driving minivans and their plans to license their tech; and Cruise Automation's infusion of $2.25B from SoftBank. Please remember: If you like this podcast, share it with you friends and colleagues; if you're listening on iTunes Podcasts, leave 5 stars; you can leave me voicemails here on Achor.fm (I promise to reply! ); and you can write me on Twitter @MarcHoag and find me on LinkedIn! Cheers! SPECIAL: UC DAVIS PROFESSOR SPERLING "3 REVOLUTIONS" PRES. The one where we ran out of time discussing Jaguar's theoretical Jaguar I-PACE SVR with 0-60 times of less than 2 seconds; and, Apple & VW's new love affair. Please remember: If you like this podcast, share it with you friends and colleagues; if you're listening on iTunes Podcasts, leave 5 stars; you can leave me voicemails here on Achor.fm (I promise to reply! ); and you can write me on Twitter @MarcHoag and find me on LinkedIn! Cheers! GDRP goes live and we take a look at the implications for the connected car; consumer groups attack Tesla for "Autopilot" name; Uber gives up on autonomous car testing in Arizona. Please remember: If you like this podcast, share it with you friends and colleagues; if you're listening on iTunes Podcasts, leave 5 stars; you can leave me voicemails here on Achor.fm (I promise to reply! ); and you can write me on Twitter @MarcHoag and find me on LinkedIn! Cheers! We talk about the impact AVs will have not just on city design, but on building design, too; I go on a mini-rant about the 73% of Americans that are scared of AVs; and we discuss what we can learn about AVs from studying airplanes. Please remember: If you like this podcast, share it with you friends and colleagues; if you're listening on iTunes Podcasts, leave 5 stars; you can leave me voicemails here on Achor.fm (I promise to reply! ); and you can write me on Twitter @MarcHoag and find me on LinkedIn! Cheers! We talk common sense when using semi-autonomous systems like Autopilot; Apple now the #2 autonomous vehicle company by number of CA testing permits(! ); Intel's MobilEye lands an 8 million car deal. Please remember: If you like this podcast, share it with you friends and colleagues; if you're listening on iTunes Podcasts, leave 5 stars; you can leave me voicemails here on Achor.fm (I promise to reply! ); and you can write me on Twitter @MarcHoag and find me on LinkedIn! Cheers! Drive.ai autonomous vehicles communicate with pedestrians; BMW clarifies its view on AVs; Ohio embraces AVs. Please remember: If you like this podcast, share it with you friends and colleagues; if you're listening on iTunes Podcasts, leave 5 stars; you can leave me voicemails here on Achor.fm (I promise to reply! ); and you can write me on Twitter @MarcHoag and find me on LinkedIn! Cheers! Ep 29. GUEST: James Newton - AVs killer app of IoT/5G? Our first ever guest interview! 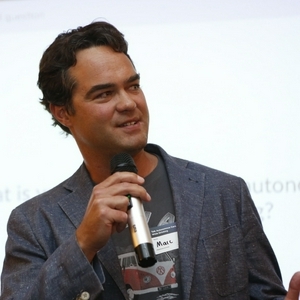 James Newton is British, has been living in France for just over 30 years and has had an eclectic career developing business in industries focused on IoT, Telematics and Automotive. I've learned he is also passionate about gardening and quantum gravity, in that order. Today, we discuss his article "Will autonomous vehicles be the killer IoT application?" which you can find on LinkedIn at https://www.linkedin.com/pulse/autonomous-vehicles-killer-iot-application-james-newton/ Please remember: If you like this podcast, share it with you friends and colleagues; if you're listening on iTunes Podcasts, leave 5 stars; you can leave me voicemails here on Achor.fm (I promise to reply! ); and you can write me on Twitter @MarcHoag and find me on LinkedIn! Cheers! SNEAK PREVIEW: Join us Friday 7AM PT for our first guest! Join us Friday, May 11, 2018, for our first ever guest! James Newton, a veteran of the automotive and IoT industries, joins us from Toulouse France, to discuss his article "Will Autonomous Vehicles be the Killer IoT App?" (https://www.linkedin.com/pulse/autonomous-vehicles-killer-iot-application-james-newton) and much more besides. Be sure to tune in! Please remember: If you like this podcast, share it with you friends and colleagues; if you're listening on iTunes Podcasts, leave 5 stars; you can leave me voicemails here on Achor.fm (I promise to reply! ); and you can write me on Twitter @MarcHoag and find me on LinkedIn! Cheers! Today: Uber's crash the result of a software calibration error; Volvo's cars and trucks talk together; MIT's autonomous cars don't need maps. Please remember: If you like this podcast, share it with you friends and colleagues; if you're listening on iTunes Podcasts, leave 5 stars; you can leave me voicemails here on Achor.fm (I promise to reply! ); and you can write me on Twitter @MarcHoag and find me on LinkedIn! Cheers! Today: Thermal imaging cameras help autonomous cars see the world around them; Facebook's game plan with autonomous cars; and BMW finds a laser supplier for its ride sharing autonomous car fleet slated for release in 2021. Please remember: If you like this podcast, share it with you friends and colleagues; if you're listening on iTunes Podcasts, leave 5 stars; you can leave me voicemails here on Achor.fm (I promise to reply! ); and you can write me on Twitter @MarcHoag and find me on LinkedIn! Cheers! Today: Google prepares Android Automotive to be a sort of "car OS" for all automakers; slime molds may offer a solution for autonomous car navigation; and Michigan's governor's view regarding AV testing regulations. Please remember: If you like this podcast, share it with you friends and colleagues; if you're listening on iTunes Podcasts, leave 5 stars; you can leave me voicemails here on Achor.fm (I promise to reply! ); and you can write me on Twitter @MarcHoag and find me on LinkedIn! Cheers! Our 2-monthiversary! Today: BMW says humans aren't ready for AVs; a Tesla's Autopilot swerves to avoid being flattened by a big rig truck; and -- coincidentally -- Tesla's Autopilot lead heads to Intel. Please remember: If you like this podcast, share it with you friends and colleagues; if you're listening on iTunes Podcasts, leave 5 stars; you can leave me voicemails here on Achor.fm (I promise to reply! ); and you can write me on Twitter @MarcHoag and find me on LinkedIn! Cheers! Today: Autonomous taxi startup Voyage open sources its testing software; a Tesla Model X hits the gym (literally); and, we discuss an important detail contrasting Waymo's philosophy of autonomous car tech to that of its competitors. Please remember: If you like this podcast, share it with you friends and colleagues; if you're listening on iTunes Podcasts, leave 5 stars; you can leave me voicemails here on Achor.fm (I promise to reply! ); and you can write me on Twitter @MarcHoag! Cheers! Episode 22! Today: We discuss how Tesla and Waymo go about collecting driving data in radically different ways, and what it means for their ongoing development of their autonomous car technology; Buick announces a gorgeous new 370-mile range EV; and Tesla starts sharing photos. Please remember: If you like this podcast, share it with you friends and colleagues; if you're listening on iTunes Podcasts, leave 5 stars; you can leave me voicemails here on Achor.fm (I promise to reply! ); and you can write me on Twitter @MarcHoag! Cheers! Our biggest episode yet, clocking in at a whopping 27 minutes! Today: We discuss vehicle-to-vehicle (V2V) and vehicle-to-infrastructure (V2I) communications; discuss why it's ok that Tesla's Autopilot will never be perfect; and briefly touch on Porsche's reservation system for its new Mission and Mercedes' upcoming EQS EV sedan. Please remember: If you like this podcast, share it with you friends and colleagues; if you're listening on iTunes Podcasts, leave 5 stars; you can leave me voicemails here on Achor.fm (I promise to reply! ); and you can write me on Twitter @MarcHoag! Cheers! Uber's CEO still strongly support autonomous cars; my thoughts surrounding a lawsuit around the Model X crash; and a brief -- very brief -- overview on solid state lidar: smaller, better, cheaper. Porsche announces full electrification by 2030; a mini review of the Jaguar I-Pace first drive; and I share my full review of Tesla's latest Autopilot behind the wheel of a fully loaded Model S P100D. Today! The CA DMV allows testing and deployment of FULLY driverless cars on its roads; two Tesla owners post videos testing and recreating the recent Model X crash (yes, really); a(nother) Chinese EV startup is born; and more. Ep 17. Tesla's stock; a 1000hp EV SUV; an AV gets ticketed! We discuss Tesla's plummeting stock as it relates to Model 3 production woes; an astonishing new EV SUV with 1000hp; and a Cruise Automation fully autonomous car getting ticketed on the streets of San Francisco. The one where we talk about Jaguar partnering up with Waymo; a blind spot in Uber's lidar system potentially causing the tragic accident in Arizona; and a horrific Model X accident in the San Francisco Bay Area. Lidar maker is "baffled" by Uber autonomous test vehicle; Tesla starts rolling out its new mapping software; Porsche declares that it is NOT benchmarking the Tesla Model S. Right. I make the controversial claim that if we as society are ok with allowing cell phones in cars, then it must be the case that we're ok with autonomous cars, too. Also, BMW announces two new products in its nascent "i" product range, the i4 and iX3 SAV. Ep 13. Risk vs. Benefit of Autonomous Cars; licenses; etc. We'll discuss the risk vs benefit of autonomous cars; the difficulty of getting drivers' licenses in the future; how autonomous cars will gradually phase out human-driven cars on streets and freeways; and a favor to ask of you! The one where we analyze Uber's tragic accident that killed a pedestrian; also, details on what may be the next big thing -- Chrysler! -- with their surprise roll out of the Portal Concept (formerly, the SM-1). BREAKING NEWS: An autonomous Uber has struck and killed a pedestrian in Tempe Arizona; we discuss responsibility and liability in cases of autonomous car accidents; and finally, what's the solution to "bad actors," criminals holding up autonomous cars? The one where we discuss details on Tesla's recent Autopilot update (that were not yet available for yesterday's episode); we go into more details about GM's production 2019 Cruise AV fully driverless (no steering wheel!) vehicle; and get a look into Ford's $11B plans for autonomous, hybrid, and electric vehicles. The one where we talk about Tesla's new Autopilot and Supercharger price increases; Germany's love affair with EVs; and Waymo's new driverless car putting passengers to sleep. Ep 8. Tesla, Starsky Robotics, Trolly Paradox SOLVED! The one where we discuss Tesla's limited product line; self driving trucking company Starsky Robotics' Series A; and the solution to the infamous "trolly paradox." The one where we talk about the new electric cars announced by Porsche and VW at the Geneva Auto Show, and loop back to the previous episode to continue our discussion on the interesting topic of autonomous car sharing. California's DMV has announced that fully autonomous -- driverless -- cars will be allowed on the streets starting April 2, 2018. Meanwhile, Volvo has launched its own venture capital arm. A brief overview of why we actually NEED self driving cars. The one where we discuss the legality of owning older cars once autonomous cars are mandated; the value of a bulletproof Tesla; and Volvo’s plans to completely end conventional internal combustion engine development. The very first episode of Autonomous Cars with Marc Hoag where I share with you my first experience in an autonomous car, the Tesla Model S with Autopilot! Remember - I encourage feedback and back and forth discussions, so don't be shy! Leave messages!